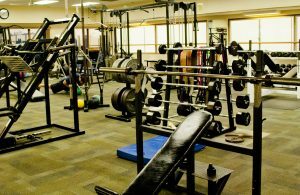 The Tucson Racquet & Fitness Club’s weight room offers something for everyone. A wide selection of free-weights, plate loaded, and cable machines are complemented by mats and functional equipment such as BOSUs, balls, bands round out the space. Soft carpet flooring, television and a great view of the racquetball courts make this weight room much different than other gyms. Adjacent to the weight room is our full Cybex Circuit. As with the rest of the Club, these facilities are open 24 hours a day, 365 days a year!